The Fourth of July is my absolute favorite holiday. I mean how can you not get caught up in the beauty of this great Country we live in? Every time I see the colors red, white and blue together I feel a rush of patriotism and want to start singing the national anthem! To bring that spirit into my home, I came up with this beautiful garland. Made from dollar store napkins and a piece of ribbon, this project is easy peasy. Open up your napkins and cut in half. Each napkin will make two pieces of your pinwheel. I made six pinwheels for my garland which means I only used 12 napkins. I still have half a package left for entertaining! 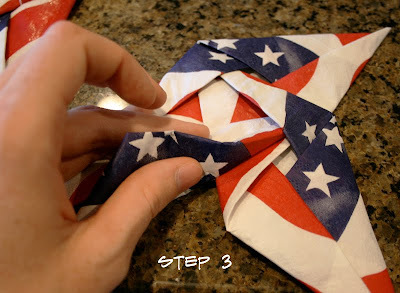 Step 2: Created six pinwheels using the tutorial from my Paper Folding Party HERE. Depending on how you fold your napkins and how you connect the pieces, you can make different patterned pinwheels. I wanted the variety of alternating patterns for me look, but you could make all of your pinwheels the same for a more unified feel. Sprayed completed pinwheels with a clear coat spray to make the napkin stiffer. 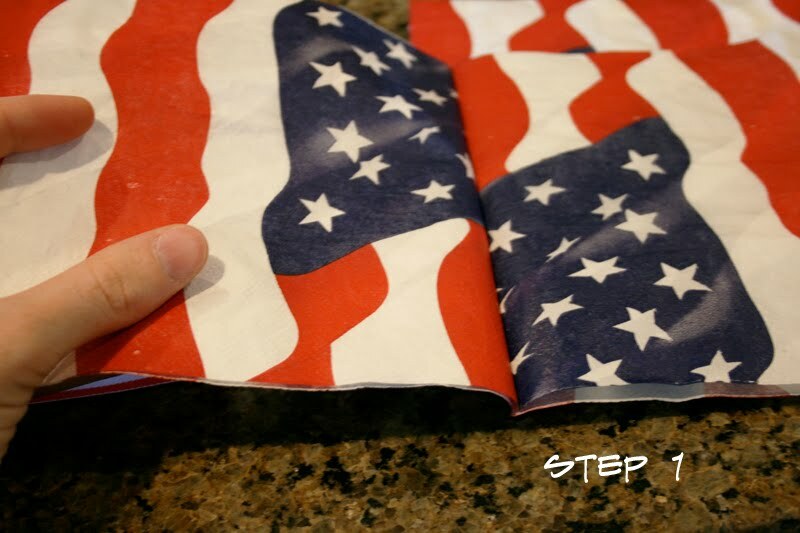 Hang above your doorway, fireplace or a window and celebrate this Fourth of July in style. Voila! 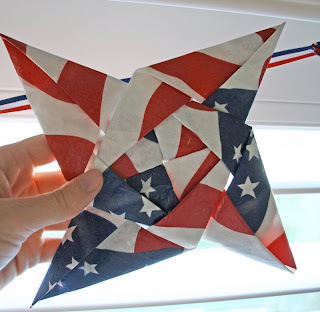 A beautiful Americana Pinwheel Garland. I love it! I needed something to make for July 4th! Thanks! Great idea! i went to the link, though and it is for folding a box? I can't find the pinwheel fold in any of the parties- not sure what I am missing. I'm hoping to make these for a birthday party tomorrow, so would really appreciate any clarity you can offer! Love it! You know how I love Americana. 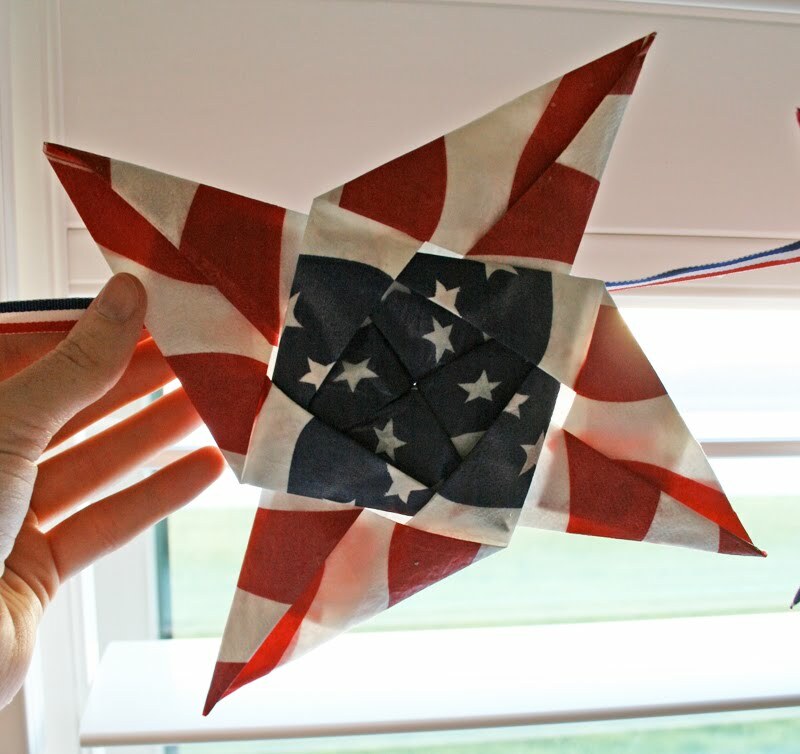 If you scroll down on the box tutorial, you'll see the pinwheel example!